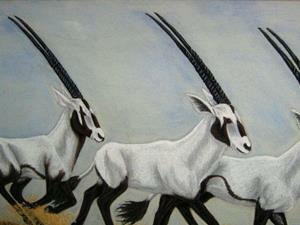 Arabian oryx are one of the most endangered species on the planet. These antelopes, related to gembrok, live in harsh desert areas of Africa and the Middle East and have been hunted to near extinction for their horns, which are mistakenly thought to have aphrodisiac powers. Captive breeding programs have elevated some of their numbers, even to the point of re-releasing some back into the wild, but they still have a ways to go to reach sustainable populations. 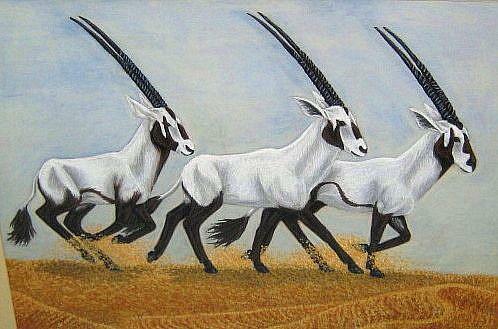 I've always liked these animals and wanted to imagine them racing across the desert dunes unthreatened.